It’s amazing what you spot when out and about in Yosemite, in the US. 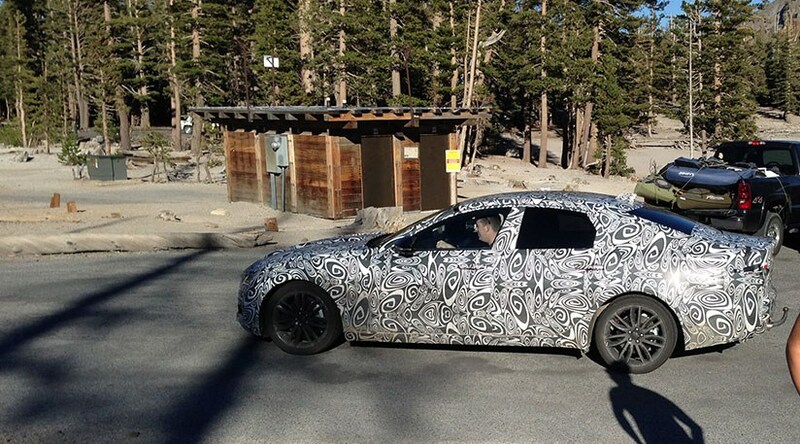 A CAR magazine reader, who preferred to remain anonymous, spied the next-generation Jaguar XF on a prototype test. Our friend was in the national park, home to great twisting roads, not much traffic and some suitably high altitudes for powertrain testing - not to mention some cracking views. ‘It looks to be a never-before-seen large-bottomed Jaguar,’ said our man, when he stopped in a parking lot in the woods. The black-and-white swirly-whirly disguise stands out amongst the US-spec passing traffic. But there’s no doubting: this is the new 2016 Jaguar XF. This car was scooped by CAR back in August 2014. It’s codenamed X260, signifying the project to replace the current XF. Our reader’s spyshots confirm that the next model will stick with the current Jag wardrobe, as espoused by the latest XE compact exec, XJ and XF. So there are narrow, squinting headlamps, a big oval grille and smooth Jag surface language, just visible under the camo of this test car. Not visible are the aluminium innards of the next XF, which is due to adopt Jaguar Land Rover’s new lightweight architecture to trim the kerbweight of the newcomer. All the better to allow the new Ingenium range of four-cylinder engines to be fitted, although V6s and more should be available too. Looks like Jaguar's in an advanced state of testing; Yosemite is near Death Valley for hot-weather testing and heat soak cycles, and provides a cooler tonic with its mountainous roads.